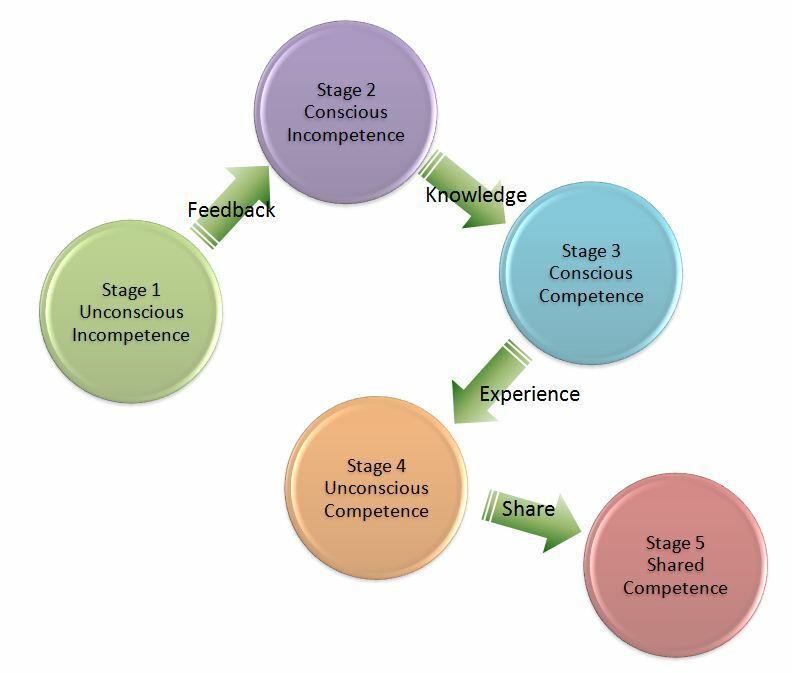 five stages of competence and how to move from stage to stage? During a recent continuing education session, the instructor covered these five stages of competence, she was not able to cite a source. Here is my interpretation of the lesson. Since this training session, I have come across many references to the 4 stages and one or two on the 5th stage. However the areas that seems to get little attention is what it takes to move between the stages. Now let’s look at how we can move between the various stages, after all isn’t that what it is all about? Feedback is the catalyst that enables someone to start this journey because it creates the awareness. The key thing about feedback is that the person that is receiving the feedback can choose to act upon the feedback or disregard the feedback. I have found people disregard very good and accurate feedback because they were not ready to change or because they did not like the messenger. According to Sir Francis Bacon, “Knowledge is Power” and in this case it is the power to move from Stage 2 to Stage 3. I look at knowledge gathering and continued growth as stocking my bank account. Just like the real world where I need to work and gather funds to store in my bank account for a rainy day, the same holds true for knowledge. I personally do not believe that we ever leave this stage because the pursuit of knowledge and growth is a never ending journey. books – I used to have a direct that diligently would get books from the company library but left them on his bookshelf until the recall notice. This does not help!! Osmosis simply does not work with books! Schedule time to read every day, if you read for 30 minutes every work day, that gives you more than 120 hours of reading per year! mentoring – Getting a mentor because it allows you to learn from other peoples mistakes and experiences. Basically it allows you to leverage lessons that others have paid the price for. peer learning – learning from your peers is an opportunity that most people do not make use of. I have learned so much from peers that now I search out people in different organizations with different skills so that I can learn from their totally different perspectives. When I was in startups, I used my network with people in other companies. Internet – there are so many resources on the Internet that are free. The selection of blogs, podcasts, videocasts, youtube videos and free monthly articles from reputable magazines is mind boggling. Use an RSS feed reader to know when new items are published. Beware that just because it is free, it is not always right and sometimes you get what you pay for! self-study – sometimes it just takes a lot of hard work. Approach this skills and knowledge gathering and growth effort with the diligence and dedication that it takes to achieve a degree from from a top notch university. The Stage 3 to Stage 4 step is often the most difficult step because it requires you to implement the knowledge gained and to put it into practice. Take those book smarts and put them into practice by creating an action plan on how you are going to action the knowledge that you have gained. The experience step is a learning step and not just the execution step! It is imperative to implement the knowledge, learn from the experience of implementing the knowledge, gather feedback on how you implemented the knowledge, learn from the results or the lack of results. And remember that it takes time for people to process your attempt at execution. This is the piece that differentiates the fresh MBA graduate from the real world. Take that knowledge, even if you gained some of it through an MBA and turn it into experience. Learn from your experiences and continually improve! Although this is an optional step, I believe that this sharing step is the one where you can learn the most. If you think you know how to do something, try to teach it to someone else. As the saying goes “the best way to really learn something is to teach others” really does hold true and therefore I believe that learning to share your knowledge and skills really helps you perform better too. This week I had a discussion with a program manager about assumptions and not asking the customers / users open ended questions to fully understand the problem. I was discussing communication with a number of people this week where they were expressing some frustration around not achieving the results that they were expecting. I have adopted a fictional character called Larry who wants to communicate an idea to some key stakeholders. In an effort to communicate effectively, Larry has adopted a structured approach where he has laid out the the problem, the options and finally the solution. In the graphic below, I have created a graphical representation of the flow of the communication. Now, let’s take a look at this this flow. The black lines illustrate where Larry is communicating the problem, the options and finally the solution. The yellowish lines indicate the flow from element to element. Although this is a very structured approach that is well laid out. Unfortunately, as Larry found out his listeners wanting and he was not able to convince his stakeholders. This is often the case when a new idea is being presented or when the listeners are unfamiliar with the background. Because people need to catch up and from zero to where they can understand Larry’s definition of the problem. Literally they need to from 0 to 60 in 2 2 seconds flat. Also because they are still processing one element while Larry has moved onto the next element, the listeners missed portions of the options or solution definitions. Now let’s take a look at a modified version of this flow where Larry actually took a breath and checked with his listeners to make sure that they were grasping the concepts that he was trying to communicate. Quite literally he slowed down in order to speed up. Just like the previous graphic, the black line illustrate the problem definition. The yellowish lines indicate the flow from element to element. Now let’s introduce some key elements that will change the flow drastically. The green circles with the cross inside are there to provide the stakeholders with some time to think and process what Larry told them. As the stakeholders process the information, they might have questions, as indicated by the question marks. Larry needs to provide them with the opportunity to ask questions and/or provide feedback. Why feedback, you might ask. Well it is human nature that we all need to feel heard and respected and therefore it is common for the stakeholder want to add their 2 cents. This dialogue portion is critical to overcoming any fears or concerns that the stakeholders might have. As the stakeholders buy into what Larry is telling them, he needs to draw them in, with open ended questions and encouraging them to provide input. 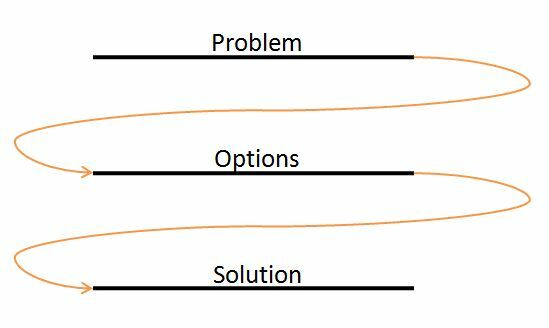 In the graphic, the blue line denotes where Larry has gathered the stakeholder input, feedback and incorporating it into the definition of Problem, Options and Solution. By getting the stakeholders to help, all that remains is for you to paint in the remaining black portion. Try this technique and please let me know what you think. I have always found it surprising that folks do not understand that brainstorming is all about getting as many ideas out. The evaluation of the ideas comes later. In an effort to get ideas out quickly and without most of the preamble, here is a mechanism that is quick and fair. Ensure that everyone understands the brainstorming topic. Ensure that everyone has at least one Sharpie and at least one Post-it pad. If you have multiple colors of the pens and/or pads, then it helps to provide extras so that it is not obvious which ideas came from a single person. Now, everyone needs to write their brainstorming suggestion on the post-it sheets using a Sharpie. One idea per page and no more than three words to explain the idea / suggestion. As the folks complete writing down all of their ideas, stick them up on a board / wall. Now group the similar ideas together. Now discuss all of the ideas and as the facilitator it is your responsibility not to belittle any idea or person. Provide a link to these instructions as part of the advanced notification. Do not shoot the messenger! Brainstorming is all about getting the most hair brained ideas out. Remember that you crazy idea can stimulate someone elses’ thinking that results in that killer idea. In the 30 plus sessions that I have used this technique, there are always a clear set of ideas that are similar. The ideas can now be evaluated on the merits of the idea and not who’s idea it is. When time is a factor, I have done steps 1 to 4 at one meeting, shorted the ideas out off line and then conducted the discussion at another meeting. Why should I listen to feedback?